Date: 2.03.2018 | Dance, Disco, Pop | Tags: New Italo Disco, Top 25, Compilation, Beach Club Records, Mimosa, Rynar Glow, Miko Vanilla, Tommy Sun, Miko Vanilla, Rovigo | Download New Italo Disco Top 25 (Compilation Vol. 8) (2018) for free. 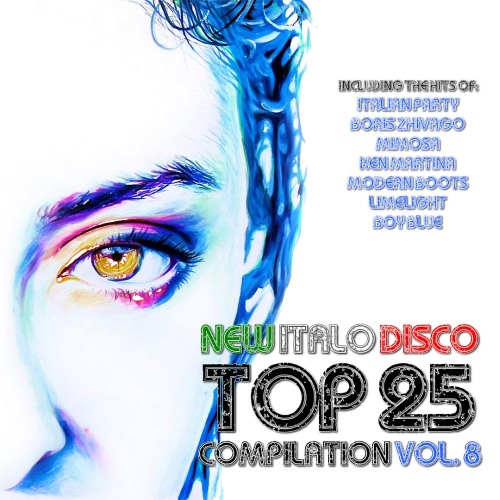 Hit Disco Top 25 Compilation Vol. 8 with lots of interesting tracks Ken Martina Producer, singer and founder of Beach Club Records. Ken is responsible among other things for the vocals of Boris Zhivago, Modern Boots, Mr. Blue and Limelight. Ken Martina came up with the idea to produce Italo Disco itself. This style/scene is said to have been named by Bernhard Mikulski to market licensed releases and numerous compilations, although not always strictly Italian productions. Thus, the term is sometimes used more broadly to describe dance music from outside of Italy and from different eras and in more diverse styles. Since 2017, some Beach Club Records also come on vinyl. Italo Disco NYC brings out various New Generation Italo Disco songs through Around My Dream Records.